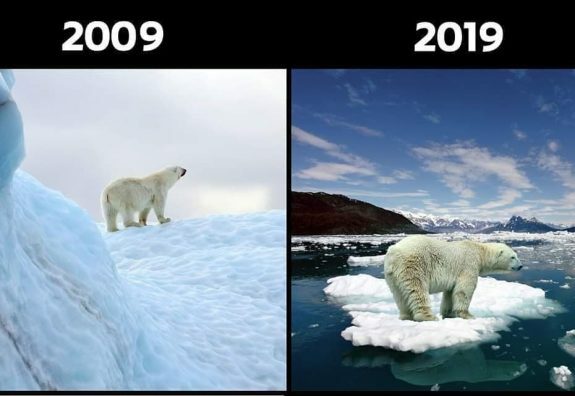 The two images of the polar bears sums up the very bad situation / outcome. Just a couple of weeks ago we were seeing truck loads of fodder being transported to drought ravaged cattle in NW Queensland. Now we see loads of fodder being dropped from aircraft to cattle stranded by floodwaters in the same areas. We are also seeing on the TV news many thousands of stressed cattle dying in muddy bogs due to the rains. These monsoonal rains are expected in the North of Australia – some people pray for them – and they arrived in abundance this year. I have to pose the question, with the greatest of respect : what risk management strategies are being employed in these areas ? People readily accepted the science behind the hole in the ozone layer because the (Chemical) industry behind the problem also provided the solution so there was no corporate need to mount and fund a denialist campaign, unlike the fossil fuel industries. The degree of research and consensus behind the climate debate goes way beyond the Ozone hole studies yet some people vigorously dispute the results. Some years ago the Koch brothers funded a feeble propaganda campaign to convince people that the polar bear population was actually increasing as if that alone proved the science was wrong and in the face of physical evidence of melting ice. Terry, they count on being bailed out by the Government and a sympathetic populace. As you point out, that land should never have been cleared for cattle. The clearing only exacerbates the damage when we get a significant weather event. 2.7m over 7 weeks around my way, while elsewhere massive heat events. And our lords don’t believe there is a problem and that it needs the mobilisation of the entire planet in order to solve it. The Murdoch press will tell us that the Qld rains are merely a monsoon event. So what put all that water in the air? And why so much? Haven’t we had monsoon events before? You know, nothing to see here. John Howard recently said he was an “agnostic” about climate change. Which is a clever way to avoid too much criticism. Not so much fuss from the climate scientists and not so much from the deniers, who saw he was at least half on their side. But why did he, as PM , not know about climate change with more certainty. He followed up by saying he believed in “traditional means” of generating energy, which gave the game away. Note the ‘religious’ fervour. We have a scientist who worked at the JCU who espoused denier talk for a decade, but was later dismissed for other reasons. He claimed that there was no great problem with the GBR and that we should look on the positive side. The Reef would recover and soil runoff has no effect on the Reef He works for dredging companies. No conflict of interest there. Then we have Judith Curry quoted in the Australian as saying there are three ways to approach climate change: ignore it, or use C20th responses such as solar, or we can wait to use C21st artificial intelligence to work out the “cycles” involved in climate change – otherwise we just keep going back the blaming CO2. Are you convinced by that palaver? Spooky!